Yesterday I met the TFM team for lunch at Thai Fresh, which is conveniently located in my 'hood. I go there quite a lot; I have favorites, and for dessert, it is the Golden Milk. It reminds me of my childhood favorite - egg custard, with that nutmeg-gy sprinkle atop. It also happens to be good for you! The golden hue is derived from turmeric - a traditionally Indian spice known for its antioxidant, anti-inflammatory, and some believe, anti-cancer benefits. I've taken turmeric capsules for several years in concert with other holistic approaches to inflammation. I'm a believer. I decided it was high time I made it myself. I started with this recipe (where I learned a whole lot about turmeric! ), and tweaked it to suit my tastes and nutritional needs. Did YOU know that by mixing turmeric and black pepper together, you increase your body’s absorption of the turmeric by 2000%? And it doesn't even take that much. I love black pepper and I think it's underutilized, especially to balance sweet flavors, so I'm all over this. Needless to say, black pepper did make the cut. I also added some metabolism-boosting spices: cayenne pepper and fresh, grated ginger, along with cinnamon and cardamom. 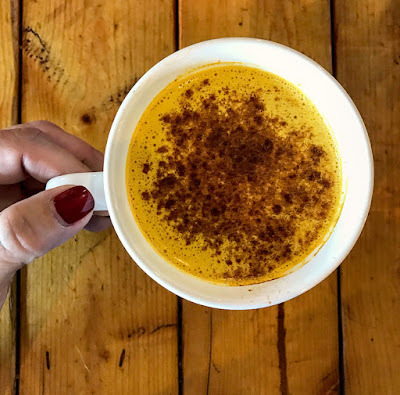 I used coconut milk as the base, and just a few drops of maple syrup-- I found the golden milk sweet enough without a lot of added syrup or honey; I primarily sweetened it simply to temper the bitterness turmeric can sometimes impart. Your mileage may vary. Ayurvedic practitioners recommend consuming this golden milk every evening before bed. They hold that it promotes relaxation and good sleep. I'm not sure about that, but I'm willing to give it a try. Have you incorporated Golden Milk into your diet? I'd love to hear about your experience in the comments below.